Next week (March 9), our family will celebrate the day we held our daughter Phoebe for the first time. On March 9 she was placed in our arms, and we became Forever Family. Many in the adoption world call this day “Gotcha Day.” The phrase “Gotcha” is quick, easy, and understandable. But over the years, that phrase has just not sounded right to our ears. If you like the phrase, hey that’s great! Sometimes we wish we didn’t think so hard about words, but that’s who we are so we do. Finally, we chose an alternative for our family. Here, I will share two primary reasons we chose to go with the phrase Forever Family instead. First, spoken words reveal the heart. Jesus said that a person’s heart can be known by the words that flow out. Our words reveal our worldview. When we reflect on our view of March 9, we didn’t “catch” Phoebe because we ran faster. She was not and is not an object or person to be attained. “Got you” brings up those playground games of tag in our minds. Rather than “getting” by any strength from ourselves, we believe God placed her in our arms to love and steward and care for her because God is the One who “sets the lonely in families” (Psalm 68:6). That day was not about our getting Phoebe or Phoebe getting us. Rather it was a day where God connected two areas of the world for the sake of caring for one little girl whom God loves deeply. It was a tender, delicate, slow-moving, surreal, precious moment as we took her into our arms the first time. Right before Phoebe was born, I declared a fast where I would not eat until God spoke to me about adoption. We just could not figure out what we were supposed to do due to our international work. Chad joined me in the fast. Eventually (thankfully!) we felt God answer us about adoption (and could eat again – hooray!). A few weeks later, Phoebe was born (I didn’t realize this for a while until I compared my journal to her birthdate). Looking back, I see that our amazing God was setting Phoebe into a family before her birth mom even gave her birth. God looked across the earth and matched us with her. God provided this child a family before she ever took her first breath. We didn’t “gotcha,” rather, we simply followed God, God made divine connections, and God chose a child for us to love forever. From a theological perspective, when we come to faith in Christ and are adopted by God, we don’t think heaven rejoices shouting, “Gotcha!” Rather, the Bible uses familial terms to define and describe what happens when spiritual adoption takes place. We are simply tools chosen by God to nurture her, love her, raise her and release her into God’s purposes. We are the ones with the honorable title of “mommy” and “daddy” that this child will say (or mama as she says constantly!). We didn’t win her; we were connected by a God so large and majestic and yet intimately involved in details- all at the same time. God’s majesty and God’s concern enabled Phoebe to be placed into our arms. The miracle of adoption – amazing. Secondly, in our career we spend a lot of time thinking about the “hearer’s perspective”. We seek to discover how the Gospel can be better understood in contexts where the people group has never heard of Jesus. I think this is what has bothered Chad and me about the phrase “Gotcha Day.” What does that phrase sound like to the adopted person? On March 9, 2015, baby Phoebe knew nothing of what was taking place on her behalf – by both the Creator God and by human instruments. She woke that morning, not knowing that within hours all she had ever known would stop and a new life would begin. March 9, 2015 would mark the day that Phoebe would suddenly be fully surrounded by foreign people who talked, smelled, and acted differently than anything she had previously known. To us it was a day of excitement as our adoption process was nearing its end and the journey of being family with Phoebe began. To her that day was full of change, and probably quite a bit of confusion and fear. 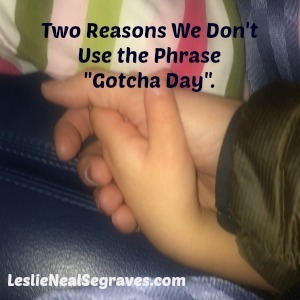 As I struggled with the phrase “Gotcha Day” from Phoebe’s side of the story, I ran across various articles and blogs which revealed that many adoptees do not like this phrase (though of course, some have no problem). They shared that the day is marked in their minds and hearts with gratitude but also with sadness as they think of their birth family. As you can imagine, the day holds many layers of emotion for the adoptee. As Phoebe grows older, she won’t simply be excited to smear icing all over her face as she eats cake. As she grows older, the meaning of her story will deepen as she reflects on her past and her present. My prayer is that we will journey with her well as her story continues to unfold for God’s glory. As March 9 has drawn closer we have pondered the name we want to call this day. We chose Family Forever Day. We say this to rejoice in our family now but also to speak in faith that every member of our family will follow Christ and join His forever family. Truly our prayer is that forever we will be family forever- on earth as well as in heaven. Family Forever Day – thank you Jesus.